The Kurdish nationalist movement is abandoning a conception of armed struggle while not giving up armed actions. Its most powerful actions involving hundreds of kilos of explosives are simply about continuing the conciliation process and getting the AKP back to the negotiating table! The quality of an armed action and the political strength of it depend on their content! The Kurdish nationalist movement’s armed actions do not mean that it is defending armed struggle! On February 17, 2016 in the state quarter of Ankara, a vehicle carrying military personnel (soldiers and civilian civil servants) was targeted in an action. As a result 29 people died and dozens were injured. Prime Minister Ahmet Davutoglu and President Tayyip Erdogan lost no time after the action in issuing statement after statement that the PYD-YPG in Syria had carried out the action, and said a refugee from Rojava named Saleh Nejjar had carried it out. Not long after the PYD denied any connection to the action and said nobody of that name was affiliated to them. The AKP counted on intervening in Syria in order to prevent the creation of a Kurdish area and maintained this effort at the highest level… In particular in its debate with the USA on the subject of the PYD, it sought to strengthen its own case, and by pushing the PYD into a corner it sought to prevent it from taking any steps independent of Turkey. It sought to use this action too for this goal. From the first moment of the action, Kurdish nationalist circles also made statements and assessments to the effect that the action might be a contra-guerrilla1 one. But a short time later a statement was made implying the action was perhaps a PKK one, when Cemil Bayik said, “An action carried out in Ankara at the centre of militarism might be an action to achieve vengeance for the inhuman, savage and genocidal massacres carried out against our people.” None of these statements attributed responsibility and this came across as a rather feeble voice emerging from the swamp of conciliation. It was a statement that confused many when it came to attributing responsibility for the action, and essentially it amounted to a threat being made to the AKP government. After a statement was made that the USA was not accepting the AKP’s claims, on the third day after the explosion it was claimed by TAK (Teyrambaze Azadiya Kurdistan – Kurdistan Freedom Falcons)… Despite this claim the AKP continued to maintain that the PYD and the PKK were not independent of one another, that they were the same organisation, and it persisted in trying to get others to accept its versions. Until this claim was made, it is necessary to say that there was a good deal of confusion in the minds of Kurdish nationalists. While the AKP persisted in attributing the action to the PYD, Kurdish nationalist writers and those who tail them sometimes took a cautious attitude in the press organs of the Kurdish nationalist movement, but some thought it was a contra-guerrilla action. It should not be as simple as this for an action to become confused with a contra-guerrilla action. But actions by Kurdish nationalists can have this confused character. The reasons for this are undoubtedly connected to the conception of actions derived from the past history of the Kurdish nationalist movement, and its viewpoint on armed struggle and actions today. When the PKK first entered the arena of struggle in 1978, armed struggle was a basic part of its line… Despite some distortions in targeting and conception of armed struggle, in a stable manner it set in motion armed struggle and its targets were obvious ones. And this made the Kurdish nationalist movement worthy of esteem. Another reason for this is that at the start the PKK was a movement whose line was influenced by both socialism and revolutionary models derived from socialist countries, and its aim was power on a national basis. But with the collapse of the socialist countries, the PKK began to turn towards imperialist countries and to seek conciliation. In 1993 it declared a cease-fire and gradually for the Kurdish nationalist movement armed struggle became downgraded to a “tactic”. Cease-fire decisions followed one after the other. A reformist approach began to determine all PKK politics and tactics, the armed struggle included. The first steps on the road towards conciliation were taken in 1993. It can be said that after this the armed struggle completely became about increasing the power of conciliation efforts and about getting the imperialists and Turkey’s oligarchy to sit down at the negotiating table. When it set out on the road the aim was independence, but in every subsequent period its demands were whittled down a little more each time, and finally the Kurdish problem was reduced to the language question. At this point the aims of the struggle and methods of the struggle were openly in contradiction with one another. The demands were those that could be made by any legal party or democratic organisation, for they were within the system, and so for these demands neither a guerrilla force nor armed struggle were required. The process also gathered pace after Ocalan was captured. In all these periods we have seen ever more obvious deviations in the PKK line, both in its conception of actions and in its targets. On the one hand, in the name of conciliation it has continually made concessions, like retreating from the aim of “Independent Kurdistan” to an “autonomy” model consisting of partial self-government by local authorities, while on the other it reached the point that the armed struggle had reached its sell-by date and was being abandoned within the frontiers of Turkey. Armed struggle is also unnecessary for a movement distancing itself from the aim of power and merely seeking autonomy for local authorities. Nor is the Kurdish nationalist movement restricting itself to this – outside Turkey it is entering into relations with imperialism and has reached the point where it has no problems with serving as its ground forces. 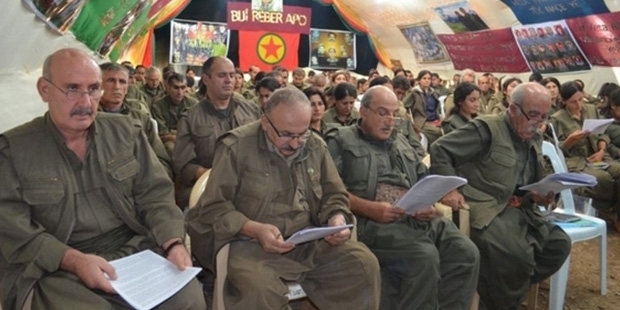 At the point it has reached, the PKK is itself rejecting armed struggle and saying weapons have served their purpose. The Kurdish nationalist movement has largely undermined its basis for engaging in armed struggle, both ideologically and strategically. Carrying out armed actions does not mean a defence of armed struggle! Many sectors completely misunderstand why the PKK supports guerrillas and carries out armed actions. One day a cease-fire will be declared, the next it will be ended for no obvious reason. On the one hand it will say that “armed struggle has passed its sell-by date”, on the other it will say “we will never give up our weapons”. One day it will say, “from now on we will wage a political struggle”, then it will say, “let us join the guerrillas.” But there is no confusion here. The PKK has ceased aiming for power. It has left the aim of Independent Kurdistan to one side. Essentially it has removed its basis for waging armed struggle. In taking steps forward and back, its only aim is to bring the oligarchy to the negotiating table. The Kurdish nationalist movement is at a point where it has no solutions. This is indisputable. But this point it has reached is not because of armed struggle but the result of it distancing itself from armed struggle and tending in the direction of reformism. All the gains of the armed struggle are dead ends and surrenders, and these are the consequences of nationalism and reformism. Carrying out a large number of armed actions does not mean that an armed struggle is being conducted. Essentially armed struggle is a political struggle. The quality of the armed struggle depends on the correctness and health of the ideology directing and being directed by it. As we view it this way, the way the Kurdish nationalist movement is slipping and sliding ideologically means it cannot maintain a persistent and stable line on armed struggle. Throughout these periods the PKK has also expressed a great many distortions in armed struggle and armed actions. This ultimately comes from distortions in its understanding of actions. As a petit bourgeois nationalist movement, it carries out actions in revenge for the oligarchy’s contra-guerrilla attacks on the people which themselves harm the people, and look like actions the contra-guerrillas might have carried out. From the Cetinkaya shop action to village massacres in Basbaglar, it has put its signature to quite a few actions like that. And it has defended this behaviour for years. So in a number of places, PKK actions resemble contra-guerrilla actions and this makes it easy for the oligarchy to engage in demagogy about the PKK, and contra-guerrilla actions can easily be passed off as PKK actions. In recent years the PKK has had a line of “discussions” and “conciliation”, so it has been more circumspect about carrying out actions that affect civilians, but it has never made an open and sincere self-criticism for past actions and continues to see them as feasible types of action. Actions by TAK in particular have a character of not targeting the military but harming civilians. Also TAK comes across in these actions as having the force of a kind of PKK. And this is why it can quite calmly be stated by the Kurdish nationalist environment that these kinds of actions might be contra-guerrilla ones. At the very least it might give rise to this thought: if a major action is carried out in an area called “The State Quarter” (Turkish: Devlet Mahallesi) and if there is an absence of political clarity in an action targeting the state forces, with civilians also travelling in the service vehicles being targeted in addition, the thought will readily come to mind that this is a contra-guerrilla action. On the other hand the Ankara action was not clearly and unambiguously claimed by the PKK, it was claimed in the name of TAK. In other words, the Ankara action was also assessed as part of the process of conciliation and carried out with this aim in mind. While the behaviour underlying the action created confusion in people’s minds, claiming the action clears the matter up. What does “angry Kurdish youth” mean? Why does Bayik use such a concept so devoid of politics? He is not clearly claiming the action, presents it as the work of angry youth and is showing the iron hand in a velvet glove. He wants to say, look what will happen if you don’t reach agreement with us. At this point it has become clear that they are continuing to struggle in vain in the swamp of conciliation and this latest action was also done in the name of reaching agreement with the AKP. It is also clear that at this point the action did not directly target state institutions. On the other hand, we are seeing continuing threats from the PKK over a period of time… Murat Karayilan, Cemil Bayik and other KCK leaders are threatening to step up the war. Cemil Bayik put forward winter conditions etc. as an excuse, saying that a lot of things would happen in the spring. But in reality there is no consistent and determined behaviour on display as regards renewing armed struggle or developing the war. On the contrary their behaviour is about trying to breathe new life into reconciliation. While Kurdistan is being levelled to the ground, Kurdish cities burned and destroyed and corpses disfigured beyond recognition emerge from Cizre, the Kurdish nationalists have done nothing but seek to raise false hopes in the name of reining in the anger of the people. The Ankara action has caused a number of disputes about conceptions of armed struggle… The AKP wanted to use it to pressurise the PYD and obstruct the establishment of a Kurdish state. But the USA above all prevented them from doing this. The USA has moved to protect the PYD. Then the action was claimed by TAK and all the AKP’s lies were exposed. Both in the form of the action and its targets, it was also considered to be a counter-guerrilla one. Both the history of the Kurdish nationalist movement and its concept of actions played roles in this, as did the fact that rather than state institutions in the “state quarter”, civilians using service vehicles were among those targeted. While largely abandoning the line of armed struggle it had when it first emerged, the PKK has reached the point where armed actions are merely about achieving conciliation. The main reason is that their targeting has gone backwards and is governed by a petty-bourgeois nationalist viewpoint. A movement that does not aim for power also has no need to wage an armed struggle. While the PKK is abandoning a conception of armed struggle it is not giving up armed actions. It can still carry out actions today. But today the most powerful weapons it uses are in the service of reaching conciliation and continuing the process of conciliation. So it is an error to expect the PKK to restart the war and embark on open war against the oligarchy. The PKK with its threats and its statements that “we will renew the war” is trying to re-awaken hope among the people. The PKK is a movement which has broken away from a line of armed struggle and is swimming in the swamp of conciliation. The liberation of the Kurdish people means revolution and stepping up armed warfare. Please support us on social networks.